John has been a fan of the blacks and whites since he was around 8 years old, in his teens finding true love listening to Rhodes and Wurlitzer electric pianos (especially as played by Herbie Hancock, Patrice Rushen, Joe Zawinul etc.) and big Hammond, clavinet, and analogue synth sounds. Age has not wearied him, but he delights in the advances in technology that have led to hundreds of kilograms of keyboard awesomeness being neatly compacted into one 9 kilo Nord Stage! A jack of no-particular style, he footnoted on rock, dance, funk and jazz tracks before being invited by Darrell Archer to join Night Radio where he has added colours, twinkles, grunty washes and odd bursts of enthusiasm. John says of Night Radio, "I look in wonder at where we have come from as we are blown backwards into the future at a rate of knots only time will tell". An inveterate optimist his favourite quote is, "The bad note is the one that refuses to die". Darrell has sung and played guitar with 80's garage band THE UNCONTROLLABLE URGES; performed in the remarkable underground Sydney trio FIRESTATION; played at the Basement with instrumental quartet MONNIPENNI; written and recorded for TV and FILM; sung a MARTY ROBBINS tune unaccompanied at a primary school assembly; taught GUITAR for twenty years; buried the HATCHET; maintained a relationship with NIGHT RADIO for twelve years; enjoyed the music of DOC BOGGS and ARVO PART equally; and intends to go on writing and performing his music for anyone who cares to listen. He lives in a lovely house somewhere near the MARRICKVILLE DELTA with his RUSSIAN LIBRARIAN WIFE. Jack Rôbin accidentally joined Night Radio in the winter of '99. The first thing he can remember coming out of Darrell Archer's nicotine fog was "Can you read a chart?". Unhappily, this was at the end - rather than the beginning - of his " audition" as the new bass player for "Caravan Park", Night Radio's pupal stage. Once he wrapped his head around the snaky arrangements and haughty chord progressions, Rôbin began to inflict himself on the band in earnest. "Ghost Stories", Night Radio's very first album, was largely demoed, recorded and mixed at his "studios" in Balmain and Drummoyne. The tequila and red wine which informed these sessions is evident to even the casual listener. Rôbin, with expanding family in tow, eventually decamped to sunny Brisbane, which he steadfastly refuses to call "Bris Vegas", for the same reason he refuses to wear novelty wigs. He doesn't "do" zany. He keeps his hand in occasionally mixing and mastering Night Radio's output, and still regards himself as a full-fledged infrequently playing member. Whether anyone else in the band does is …well... sort of besides the point. Michael Ward fell into the Night Radio camp when the group thought it was about time to release their first album Ghost Stories and looking around, realised their drummer had split town. Ward was summonsed by Darrell Archer and can be heard on all subsequent recordings and live shows when he himself is not splitting town with other bands he keeps association with. Sometimes he does some of the business stuff behind the scenes for the band as well, sometimes not. Robin was asked to play some cello for the launch of Telluric in 2006 and pretty much just stuck around afterwards. He contributed assorted bowed, plucked and strummed string instruments to Backroads and Down the Coast, and in Night Radio’s infrequent live outings tends to play lapsteel, banjo and cello. 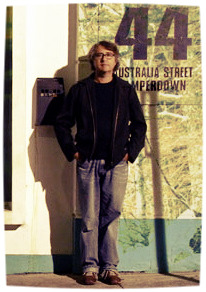 Over the last decade, Robin has also done time in around a dozen other Sydney bands; at the moment he plays cello with Melodie Nelson and the Singing Skies, is the de facto bandleader of the Leichhardt International Ukestra, and is belatedly working on a solo album due for release sometime before 2020. One night, while driving down the backroads by the Williams River, Jerome and his son called in on Night Radio and recorded bass and shaker on a track for their album, appropriately called ‘Backroads’. Jerome is now one of the remote bass players for the band. In keeping with his rural, regional and remote status, he provided the venue amongst the cicadas for them to record ‘Down the Coast’. Listen for the directions to the farm in a song but don’t follow them – you’ll get lost. Jerome played bass in the 80s "almost was" band Samurai Trash and was later rescued from the black dog by the call to share bass duties in the everlasting Exploding Happiness, where he met his Night Radio cohorts.